Creative mind patterns emanated as fields below creativeness is expressed as latent vital function. 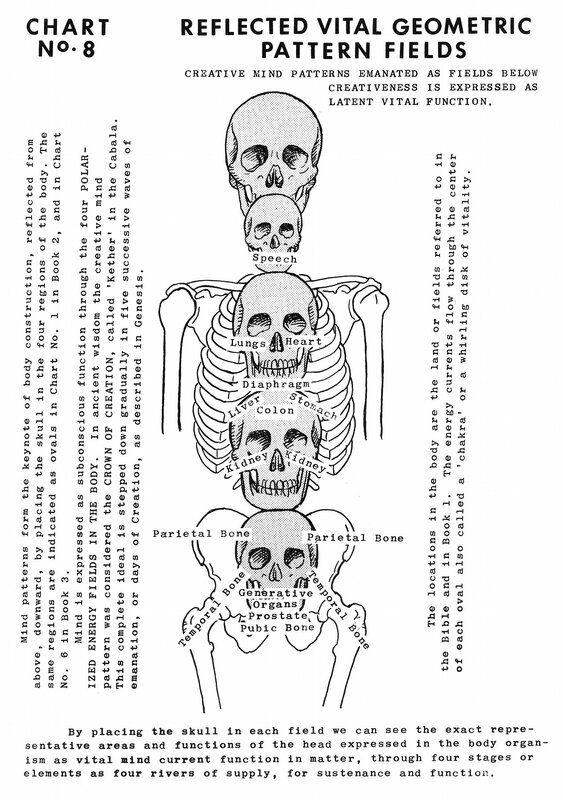 Mind patterns form the keynote of body construction, reflected from above, downward, by placing the skull in the four regions of the body. The same regions are indicated as ovals in Chart No. 1 in Book 2, and in Chart No. 6 in Book 3. Mind is expressed as subconscious function through the four polarized energy fields in the body. In ancient wisdom the creative mind pattern was considered the crown of creation, called 'Kether' [Keter] in the Cabala [Kabbalah, Kabala]. This complete ideal is stepped down gradually in five successive waves of emanation, or days of Creation, as described in Genesis. The locations in the body are the land or fields referred to in the Bible and in Book 1. The energy currents flow through the center of each oval also called a 'chakra' or a whirling disk of vitality. 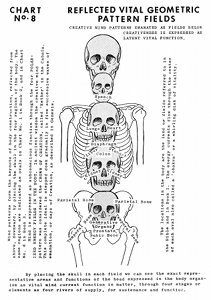 By placing the skull in each field we can see the exact representative areas and functions of the head expressed in the body organism as vital mind current function in matter, through four stages or elements as four rivers of supply, for sustenance and function. Book 5, "Explanation of Chart No. 8"